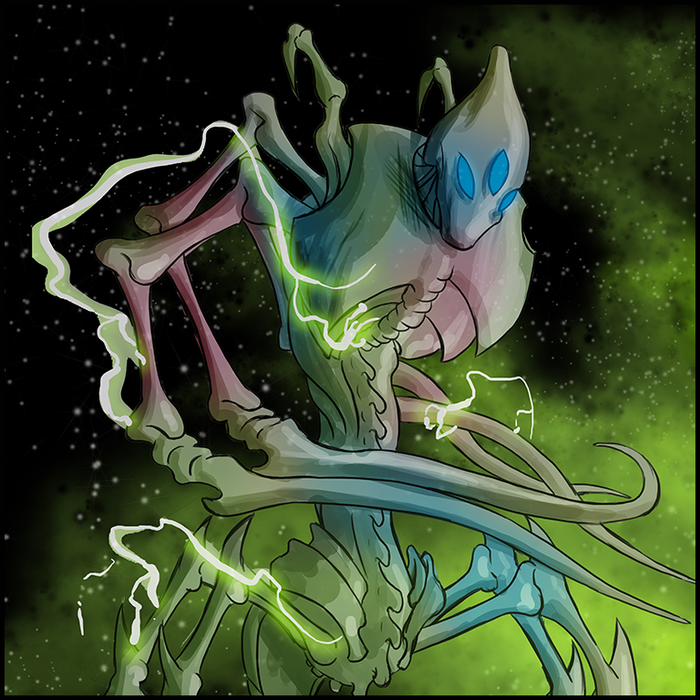 Society: War Spectre society is centered on a vast region of space known as the Oothagos Expanse, but War Spectres can be found throughout the galaxy, pursuing trade contracts and mysterious axiomatic protocols with equal fervor. Few members of other races have traveled far in the Expanse, but those who have made the journey report a vast area filled with planets and lead by a small group of high-ranking War Spectres known as The Cynosure. Scholars of War Spectre culture also note a lack of any gender or family structure, and it is speculated that new individuals arise spontaneously from the coalesced remains of other Spectres. Technology: War Spectres possess an innate understanding of psychic energies, and as such are able to merge their consciousnesses with those of other creatures. Unlike other races, War Spectres do not construct vessels, but instead use and modify interstellar megafauna to suit their needs. While many of these living vessels form a symbiotic unit with their crew, some are ensnared in a much more sinister relationship.